Up until around 1970, Oman was not considered a viable holiday destination, but as education and tourism increased in the Middle Eastern country, so too did its offerings to visitors. Omanis are justifiably proud of the progress made in the country, which used to be one of the major sea-faring nations in the world. Visitors will find the locals to be helpful and welcoming, adding a personal touch while showing off their great cities, including fascinating Muscat. The country has much to offer with its glorious mountainous scenery, golden beaches and historic cities, perfect for a holiday in Oman. There are also some more unusual locations, which while not so easy to access, offer a fascinating insight into the country. 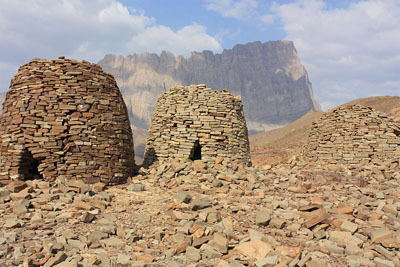 Close to Ibri in the Adh-Dhahirah region of Oman, the Beehive Tombs of Bat is an enigmatic and mysterious site. Situation in northern Oman, 100 tombs stand on the hilltops, forming what is considered to be one of the largest necropoleis in the world. While little is known about the culture that constructed the tombs, archaeologists believe they date from around 3000 to 2000 BCE and they range from relatively simple structures with a single entry and chamber, right up to tombs with two entrances and up to four chambers. The collection of tombs in Bat is the largest and best known, but there are also other sites in al-Khutm and al-Ayn. When traveling to the location, it is at first difficult to spot the tombs, as they have somehow merged with the scenery, but once a visitor arrives on the site, they are fascinating to see. Regrettably there were few artifacts to be found on the site, including water jugs, daggers and arrowheads, but in 1988 the Beehive Tombs of Bat were declared a UNESCO World Heritage Site. Visiting this huge underground cave chamber is only for the brave. Located near Quriyat, Majlis al-Jinn is only accessible through several small openings at the top, with the aid of mountaineering equipment. However, once inside, it is the second largest chamber of its kind in the world. According to Atlas Obscura, the site measures the equivalent of almost 11 football fields and the only way in is via three small openings at the top, formed by rain water dissolving the limestone of the hill. The site was only discovered back in 1983 when an American couple, Don Davidson, Jr and his wife Cheryl spotted the holes in the rock from aerial photos. They journeyed out to the area by helicopter and when looking through the openings, spotted the floor of the caves, around 500 feet below and then rappelled down to explore. 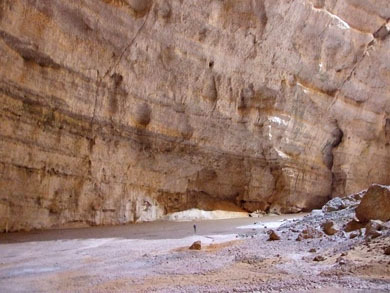 When they asked the locals whether the surrounding area had any kind of history or local name, they were told that they believed that in their folklore the cave was filled with genies, or “al-Jinn.” This led the American couple to name the site “Majlis al-Jinn,” which translates to the meeting place of the genies. Nowadays visitors can access the site with 4x4 vehicles and the cave has become a popular destination for BASE jumpers and abseilers. 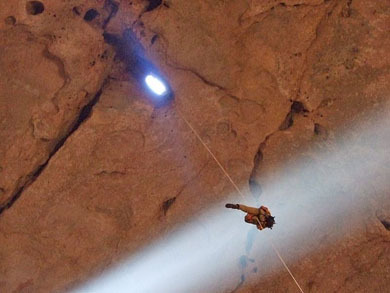 You can watch some of these brave men BASE jumping into the cave chamber in the video below.